This episode of The Wellness Business Podcast features an awesome health coach who’s giving us an inside look into how she uses workshops to fill her coaching programs. 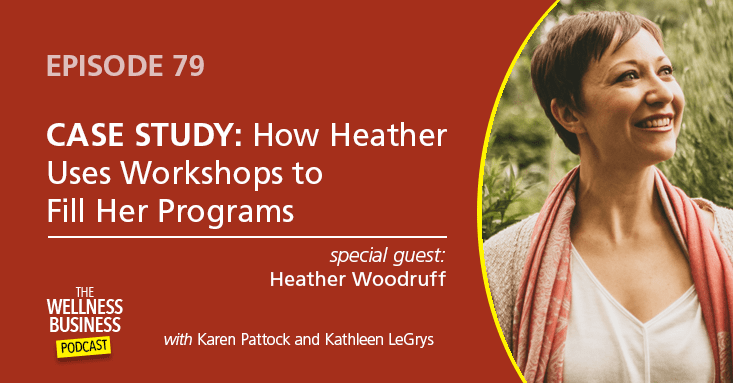 Our guest, Heather Woodruff, has taken the workshop strategy to an entirely new level, and she’s going to tells us exactly what she’s doing, so you can use her strategies in your business. She has used workshops to generate revenue, grow her email list, and enroll new one-on-one coaching clients into her program. We appreciate her coming on the podcast to talk about what she’s doing! We know you’re going to love this! If you want to know how to use workshops to get more clients in the new year, be sure to tune into this episode, because we are breaking it all down for you! 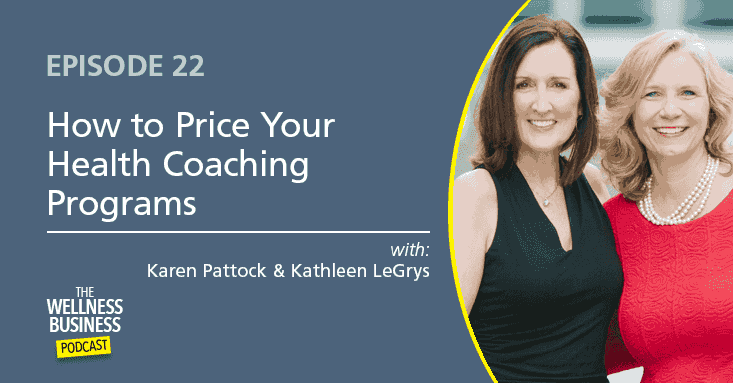 In this episode, Karen and Kathleen discuss the best way to decide how to price your coaching programs for maximum benefit. Pricing your health programs properly can be an intimidating decision. Tackle this challenging decision and begin pricing your health programs to match the value you offer! Karen and Kathleen will help you overcome these four main obstacles, plus offer helpful guidance for setting (and updating) your fees. You’ll learn six major factors to take into consideration when pricing your programs, and also discover how to find out what is your ideal clients want in a program. 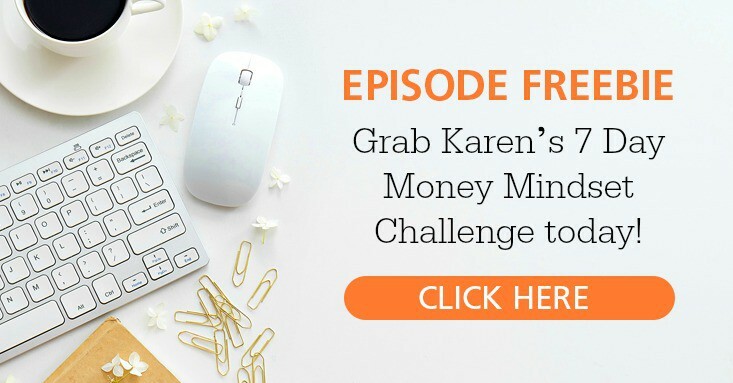 Grab Karen’s 7 Day Money Mindset Challenge today! Have a specific question for Karen and Kathleen? 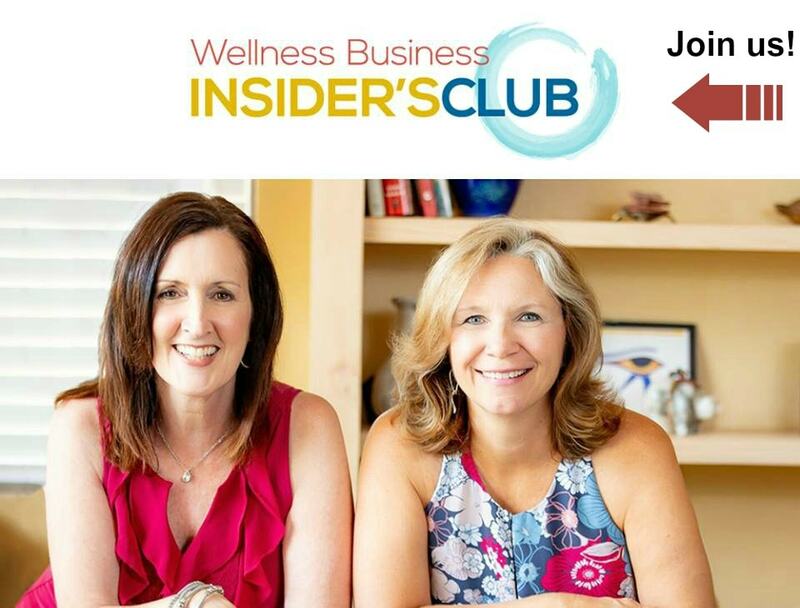 Be sure to visit The Wellness Business Podcast Website or The Wellness Business Podcast Facebook Page to reach out to Karen and Kathleen with a question! In this episode, Karen and Kathleen chat with Angie Jones, of Healthy Angie about how using the Facebook Livestream feature has completely changed her business. Angie discussed her overall strategy, how she prepares, and the added benefits she’s noticed after using Facebook Live. Just do it! Don’t be afraid of going live. Your streams don’t have to be perfect, it’s all about being yourself. Worst case scenario, delete it afterwards! Be consistent when it comes to your live streams. Try and find a day or time each week and stick with it. Promote it ahead of time. This is when I’ll be live streaming, and this is what I’ll talk about. Promoting it ahead of time lets your followers know when to tune in AND holds you accountable to follow through. Don’t worry about how many people join in on the live portion of your video. Repurpose the content! That one video can turn into a weekly email, a weekly blog post, and be shared across various social media pages, keeping your business in your customer’s minds. Know your opening line. You only have a few seconds to capture the attention of a potential customer. Know your opening hook and have it prepared. Have an outline nearby to guide you. Place any products or props you want to show in the area ahead of time. Don’t rehearse too much, it’s not about being perfect, but about being you! Remember your video will have two audiences, the live audience and the replay audience. Make yourself accessible to both. Gaining self confidence in who you are and what you stand for. Client’s reaching out more often via message or email, they have a better feeling for who Angie is now and are more comfortable reaching out to her. Angie’s email list has more than doubled! Download your FREE Facebook Live Stream Checklist. Take Angie’s lead and create a live stream for your business this week. Webinars are still a hot topic, and a phenomenal marketing tool for your business, so if you’ve been thinking about doing them, this post is coming along at the PERFECT time for you! My guest today is not only one of my dearest friends, but she’s also an unbelievable online marketing super star that ROCKS at webinars. I have learned so much from her over the years (as a coaching client of hers, and as a student of her courses that teach the ins and outs of online marketing and webinars). So, when I say you’re in for a real treat, I’m not kidding! Karen Pattock is going to break things down for you, and share her 2-Step Formula that GUARANTEES you’ll have people signing up AND showing up for your webinars! 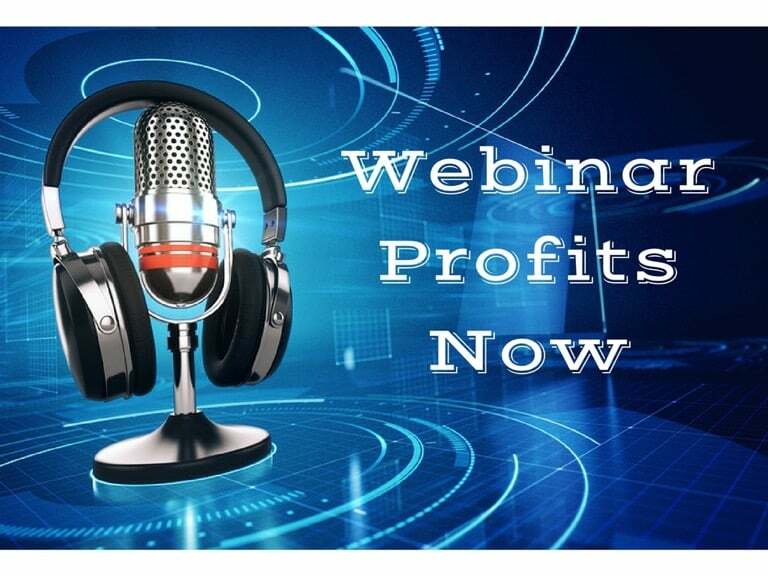 Have you ever wondered what the most important steps are to SUCCESSFULLY HOST a webinar that ends with you making lots of sales of your programs or services? If you’ve ever done a webinar, or thought about doing a webinar, you know that there are a lot of moving parts behind the scenes. 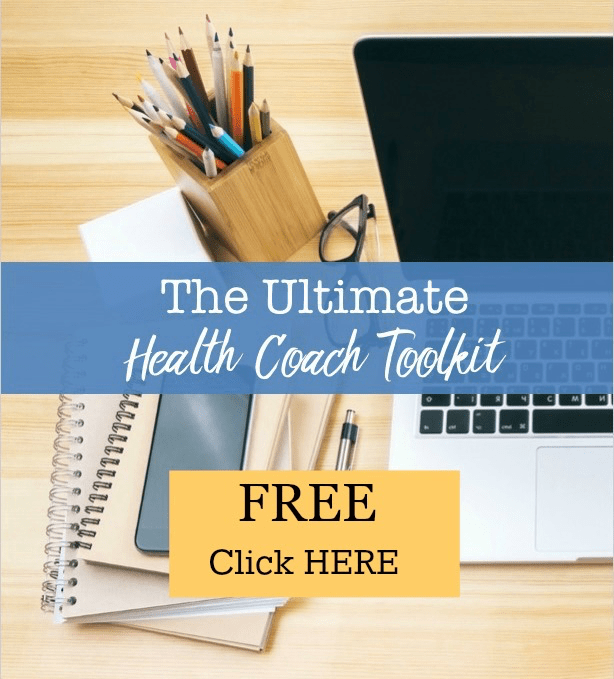 One of the stumbling blocks for most health coaches and fitness professionals that consider hosting a webinar is the fear that no one will sign up. However, with a little careful planning and one simple webinar formula, that fear can be squashed with a flood of webinar registrations. 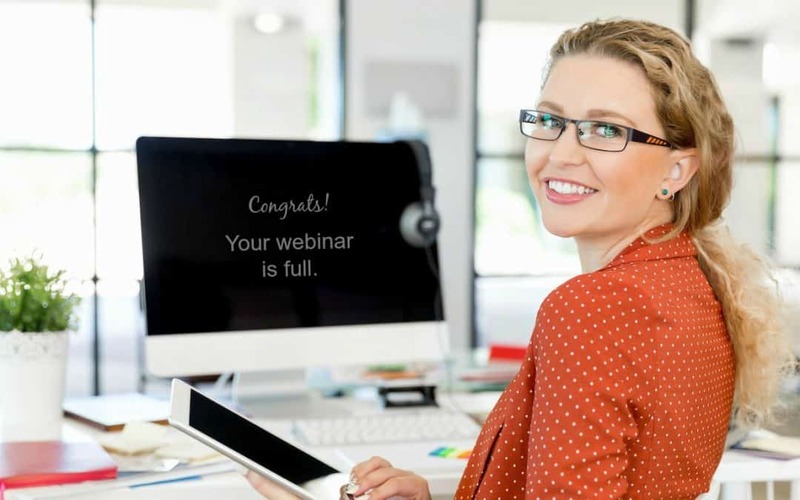 There are really ONLY 2 STEPS that truly matter in hosting a webinar. These two steps are more important than any of the other steps and without giving them your full attention it’s almost certain that your webinar will feel like a disappointment. Successfully navigating these two steps, as I’ll share in this article, will certainly help everything else become 100% easier. This may sound elementary in nature but hear me out. Most of the clients I work with decide to do a webinar, promote it a little bit to their list and on social media, get a small number of people to register, deliver the webinar and then can’t figure out why they didn’t make many sales. The truth of the matter is you need to know your numbers, (which is something I’ll be diving into with a simple ‘webinar sales formula’ in my upcoming Webinar Profits Now program). To figure out what your numbers need to be you have to ask yourself a series of questions. What’s my sales goal? (On average, you can count on 10% of total webinar registrants to purchase your offer). How many people need to register to get that many people to attend live? How much advertising do I need to do to get that many people to register? This specific webinar sales formula is a form of reverse engineering your entire webinar campaign strategy. It starts with your end goal of ‘total sales’ and keeps stepping back to the beginning letting you know exactly what you need to accomplish. Industry averages go a long way in telling you exactly what you need to do to accomplish your sales goals. Taking the time to do the calculations to answer these questions will be the difference between a webinar that generates sales in the amount of your goal vs. not. Your first goal needs to be knowing the number of registrations you need to get to meet your ultimate sales goal as we just discussed in STEP #1. Your second goal is to get as many of those that registered for your webinar to show up live. Because the #1 reason webinars work so well to make sales is because the person attending gets emotionally wrapped up in your presentation, your solution, your program. They are encouraged, inspired and empowered. They take action by pulling out their credit card to purchase. That’s the power of live attendance. Once you get someone to register for your webinar your next job is to nurture them to get them excited about attending live with a simple onboarding email sequence. 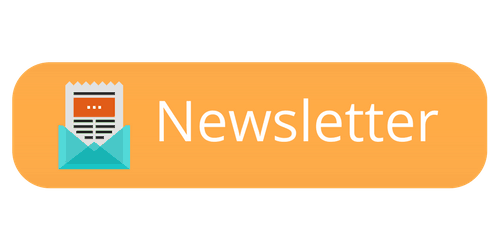 The contents of these emails can also offer cool bonuses or insider information to make your attendees feel special. Prioritizing these 2 steps along with a well thought out marketing schedule will virtually guarantee maximum registrations and attendance. As more and more people are communicating and sharing information online through mobile devices it’s the perfect time for you to educate yourself on how to design, market and deliver the perfect webinar to get more clients in 2017. I’ll be doing a deep “how-to” dive into each of these steps in my recently updated Webinar Profits Now program. If you want to learn the right way to create, promote and deliver webinars that are a hit with your audience, be sure to check it out. This is the year of webinar. It’s time you jumped on board. 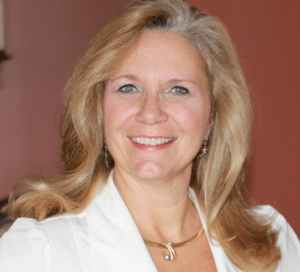 Karen Pattock is an International Business Coach and Educator specializing in Facebook Marketing and Online Customer Attraction Systems. She’s known as the “In The Trenches” Coach because she not only teaches her clients the ‘what’ of online marketing she also dives into the ‘how’ that it takes each step of the way to accomplish their goals.